With summer harvests at their peak right now, The Ritz-Carlton, Dove Mountain has introduced several seasonal menu additions which have become quick favorites among resort guests and it all starts with tomatoes and sorbet. At CORE Kitchen & Wine Bar, a new Heirloom Tomato Salad with Basil Sorbet is attracting guest raves, along with recent “savory sorbet” photo coverage in Vogue magazine. Hand-crafted sorbets of the dessert variety are also now offered in seasonal flavors of Red Cherry, Peach, and Prickly Pear Tequila. Additionally, CORE has introduced its annual summer-only sweet treat: Summer Peach and Blueberry Crumble Pie. At the resort’s Ignite Lobby Lounge and Patio, Summer Cavatelli showcases fresh heirloom tomatoes, basil, citrus, greens and peas in a lightened variation on the pasta theme. Ignite’s Buffalo Tacos continue to be an ongoing favorite, and this year, they’re frequently requested after guests enjoy a new summer appetizer of Queso Fundido crafted with chorizo and fresh scallions. 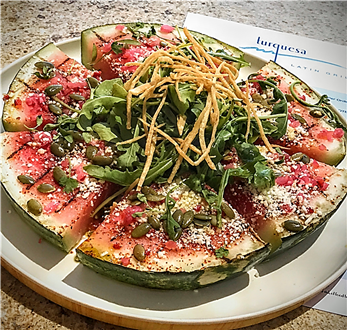 Outdoor diners can cool off poolside with a new Turquesa selection of Watermelon Pizza created with grilled watermelon, Tajín seasoning, pickled onion, cotija cheese and pepitas – or they can enjoy Seasonal Summer Fruits served with agave lime yogurt, or Summer Baby Greens presented with grilled peaches and prickly pear vinaigrette. For those who prefer cold soups and chilled milkshakes, the Cayton’s summer menu features seasonal new Sweet Corn Gazpacho, as well as Strawberry Ice Cream Shakes made with fresh strawberries, or Coconut Smoothies in which fresh pineapple makes a starring appearance. Further summer menu additions are available at all dining outlets of The Ritz-Carlton, Dove Mountain. Guests wishing to combine a restaurant visit with an overnight stay at the luxury resort will find August 2017 room rates beginning at $156 USD midweek or $234 USD on weekends. With summer temperatures averaging six degrees lower than in other major Arizona cities, The Ritz-Carlton, Dove Mountain offers summer attractions including three swimming pools, a splash pad and 235-foot water slide, an opulent destination spa ranked among the top five in the United States, championship golf, and acclaimed family and individual guided adventures – from stargazing to weekend evening scorpion hunts — offered throughout the day and evening.